George Honeyman and Max Power. Sunderland’s automatic promotion bid got back on track with a much-needed victory over AFC Wimbledon. The Black Cats moved up a place into fourth after the 1-0 win, nine points behind League One leaders Luton Town but with three games in hand. Sunderland players celebrate an away win. Sunderland face a demanding February with a further five league fixtures, though four of those fixtures are against teams in the bottom half of the table. We examine the February run and how their promotion rivals shape-up. The U’s host Sunderland on Saturday and have relied heavily on home form for points this season. Oxford haven’t won a single game away in the league this season picking up 10 points so far on the road. Currently sat in 21st place Oxford have had recent success at home beating Portsmouth 2-1 and drawing with Barnsley 1-1. In their last game, Oxford drew 0-0 at Plymouth and are unbeaten in the last four league games. We may see the debut of new signing Will Grigg in this game and the Kassam Stadium is a place he knows well. On a trip with Wigan last season Grigg scored a hat-trick in a 7-0 win and team mate Max Power scored two. Arguably the hardest of the February games, Blackpool visit the Stadium of Light next week. The Seasiders have had a decent season so far currently sitting 8th in the table. Unbeaten in four games, Blackpool drew their last game at home 2-2 against Wycombe. The club have also boosted their attacking options by signing Newcastle youngster Elias Sorensen on loan, the Dane started up front for The Magpies Under 23’s side against Sunderland earlier this year in the Checkatrade Trophy Round of 16 fixture. The third game in only six days is against Accrington, a busy few weeks for Sunderland. Stanley are currently 15th in League One and only have two points from their last five games going into Scunthorpe away this weekend. This game is the fourth in only 10 days and a third straight at home. The Gills could have lost their top scorer to Sunderland as Tom Eaves was linked with a move on deadline day. The powerful striker, in his first game after the window closed, scored a 92nd minute equaliser for Gillingham in a 1-1 draw away at Coventry. Gillingham are struggling for form this season and are currently one point above the relegation zone in 19th. The final league game of the month takes place at the Memorial Stadium, a ground Sunderland will have to visit twice in the space of a few weeks. The other time in the Checkatrade Trophy semi-final. Rovers are just a place above the relegation zone in 20th and have two games to play before Sunderland visit. Midfielder Ollie Clarke is the hosts top scorer but has only 4 goals to his name, a clear factor in their struggles this season. In an attempt to combat the goalscoring troubles Rovers signed a new striker on deadline day. Jonson Clarke Harris joined from Coventry, a striker who still only managed 5 goals in 27 games for the Sky Blues this term. 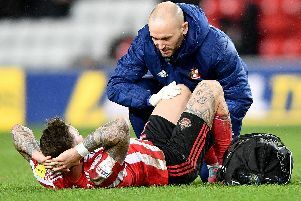 How do Sunderland’s promotion rivals shape-up this month? Sunderland are currently fourth with Portsmouth, Barnsley and leaders Luton above them. Jack Ross’ side have two games in hand over Pompey and second-place Barnsley and three in hand over Luton Town, currently nine points clear. Portsmouth, third, have four games remaining in February; Plymouth (away), Southend (away), Bristol Rovers (home) and Barnsley (home). The pick of these ties is the Barnsley fixture at the end of the month. Two of the top three facing off at Fratton Park, the reverse fixture finished 1-1 at Oakwell. Pompey boosted their attacking options by bringing in familiar striker James Vaughan from Wigan. The forward has a good record in League One and signed for Sunderland last season based off his impressive 24 goals in the previous season at Bury. Before Barnsley travel to Pompey, the second placed side play Gillingham (away), Wycombe (home) and Burton Albion at home. The Tykes managed to keep 16 goal star striker Kieffer Moore amid interest from several clubs in January - including Sunderland - a player who will continue to be vital to his side. Barnsley go into these games in impressive form with 13 points from the last five games. Charlton are currently fifth and face Southend (home), Blackpool (home) and Wimbledon (away) this month. Huddersfield Town leaving Lyle Taylor as the only player to score more than five goals this season for Charlton. Top of the league Luton haven’t lost in the league since a 3-2 defeat in mid-October away at Barnsley. The Hatters have the best home form in the country, an unbeaten run which goes into last season. February sees Sunderland-born Mick Harford, in interim charge, lead his side against Wycombe (home), Fleetwood (away) and Coventry (home). Gunning for back-to-back promotions, Luton signed Jason Cummings and George Throne on loan in January.